I have a yearly tradition that begins at the start of the new year. It pertains to the choosing of a special word which will become my theme as the year unfolds. I don’t know about you, but I prefer choosing the Word of the Year as opposed to making a New Year’s Resolution. My chosen word helps to bring focus and clarity for what I want to create in my life. In the past, I’ve chosen words such as GRATITUDE and BALANCE. This year’s word presented itself to me during a recent shopping excursion to Marshall’s Home Goods. As most of you know, I am a organized person who functions best when my environment is orderly and without clutter. This past summer my home underwent a long overdue renovation on the family room level. Furniture was moved to other areas of the house and smaller items were packed into a series of boxes. As a result, I was totally and completely discombobulated!! Although I’m far from a pack rat, I’ve been donating household items and clothing that no longer serve me. I’ve also been sorting through my file cabinet and putting aside a plethora of old documents, etc. for shredding as well as filling my recycle bin. My goal is to become as much of a minimalist as possible. 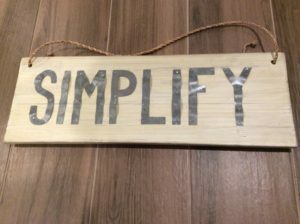 My word — SIMPLIFY — has already become a mantra as it guides my daily actions and helps me to become a happier version of myself! Have you chosen a word for 2018? If so, please share in the comment section below. Lori Weintraub is a licensed skin care therapist, holistic health coach and a hair removal expert. She offers consultations, exceptional products, results-driven treatments and hand-holding guidance to help women over 40 regain their youthful glow. Learn more here. I love the word SIMPLIFY and the energy behind it. I’ve been trying to simplify and declutter for about 4 years now. I’ve managed to let go of a lot of stuff that I’ve accumulated over 30 years of traveling. It’s so freeing. And I notice that after every layer I let go of, I’m able to see the items left behind in a new light … and the process begins again! I’ve chosen a word for the year for so many years I can’t remember when it started. But this year I opted for a statement instead. And that is…. I first found this statement in 1995 (I think) from Philosopher J. Krishnamurti. It hit me like a ton of bricks back then and it is having profound effects in 2018 already. What a great word, Lori! Like you, I am much more calm when my home is tidy and I feel that everything is in order with my family, my finances, even my emotions. The upheaval of life is a great reminder to really understand your priorities and let the rest go. Even Angela’s phrase above has that same effect – deflating the stress of a situation by completely surrendering any expected outcome – simplifying at another level. My word for 2018 is Service, and I’m already learning what a strong container it is: being of service to myself is key to being of service to anyone else…and vice versa. I’m on a similar path Lori! My word for 2018 is ease. And it feels SO good!